Stuart Christie's review of David Schoenbrun's book on the French resistance during World War II. Written by an American intelligence agent (Psychological Warfare Branch), this is the first reasonably satisfying account to date, in English, of the French Resistance. David Schoenbrun has an obvious affinity for those whose activities he describes, and his profession as a spy proves both useful and illuminating as he guides us through the murky labyrinthine world of political and military intrigue in London, Washington and Casablanca as well as Occupied and Vichy France. But it was not the Generals who fled to London or North Africa, nor the adventurers of the OSS or the SOE who constituted the French Resistance, as this book clearly shows. It was the ordinary men and women from all walks of life and varying political persuasions. They were soldiers without uniforms or proper arms who lived in the shadows as soldiers of the night and who courageously defied the might of the German military machine and their fascist Vichy collaborators. The Resistance was individual and sporadic at first, like Madame Bourgeois of Louray who shouted and shook her fist at the newly arrived invaders. She was tied to a tree and murdered in front of her daughter and her body left there for 24 hours as a warning to others who might be tempted to follow her example. However, the spirit of Resistance did spread, inexorably. It was organised either through affinity groups or political and industrial networks such as the anthropologists of the Musee de L'Homme, the Communist Party (which had a ready made network as it had been forced underground a year before the outbreak of the war), the Resistance network of the Railway Workers' Union or the Jewish Combat Organisation. There is, however, one glaring and important omission from the fairly comprehensive list of organisations and groups which made up Resistance — the Spanish Republican exiles. The contribution of the refugees from francoism to the French Resistance is fairly important yet for the most part unrecorded and unacknowledged. It is worth a slight digression as it does raise some questions as to why the historians should deliberately ignore or misrepresent it. When the Vichy Government was installed on July 1st 1940, there were an estimated 236,000 Spanish Republican refugees in France. Of these it is reckoned that 40,000 Spanish anarchists, communists and republicans joined the maquis — 5000 of whom operated in the North Pyrenees under the banner of the Junta Nacionál Española. I wonder how many of the thousands of Jews, allied airmen, POWs and refugees who escaped through the Pyrenees realised that they owed their lives to Spanish anarchist resistance and escape networks? The famous so-called SOE "Pat O'Leary" network was in fact organised by the militant anarcho-syndicalist Francisco Ponzan Vidal and known throughout the south as the "Grupo Ponzan". Between 1940 and 1944 some 6000 Spanish Republicans were killed by the Germans, and between 10,000 and 25,000 died in German Concentration Camps. Spanish exile units also played an important part in almost every Allied campaign from the battle of Narvik to VE Day, including Crete, North Africa, Italy and the Riviera Landings. Toulouse was liberated almost exclusively by Spanish guerrilla groups as were more than 50 important towns, including Clermont-Ferrand, Nimes and Marseilles. The first vehicles of Leclerc's famous Second Armoured Division (with a complement of over 3000 Spanish soldiers) to reach the Hotel de Ville during the Liberation of Paris carried memories of the Spanish Civil War emblazoned on their sides — Durruti, Guernica, Guadalajara, etc. Finally, the Spanish anarchist battalion, "Libertad", commanded by Ramon Vila Capdevila ("Scarface") — the last of the Spanish anti-francoist guerrillas who died in an ambush in the Pyrenees in 1963 — played an important role in the storming of Royan and Pointe de Grave — the last German strongholds in France. Soldiers of the Night is not simply a collection of anecdotes about heroism and selfless dedication, or even cowardice and treachery. It is a tapestry whose warp and weft combine to depict the fall of France — from the machinations of the Stalinist Popular Front which divided the labour movement to the self-fulfilling conspiracy theories of the right which blamed the national malaise on Jews, Freemasons and Communists, all of which served to hasten the collapse of the Third Republic. But apart from the historical narrative we are also given some fascinating insights into the power struggles behind the scenes, the effects of which are still with us today. Clearly there were two separate worlds. On the one hand were the ordinary men and women of France who were fighting for freedom and democracy, and on the other hand were the Allied leaders — De Gaulle, Giraud, Roosevelt and Churchill — scheming and conniving for control of post war France. De Gaulle was never recognised as the leader of the French Resistance, but because he was in the right place at the right time he was able to present himself as incarnating the spirit of Free France and was accepted in good faith by millions of French men and women as the symbol of the Resistance. By a quick piece of sharp political legerdemain he transformed the illusion into reality by declaring himself "president" of the Provisional Republic of France. One intriguing and somewhat aggravating conclusion the author leaves us with is that the long term psychological consequences on the French body politic of Eisenhower's decision to allow General Leclerc's Second Armoured Division to liberate Paris (if that is the case, and Leclerc didn't do it off his own bat!) were to be disastrous for France. The author's premise is that Leclerc could not have done it without the support of the Americans, therefore the idea that Paris was liberated by the French was a myth and self-delusion. According to the author, this gave rise to the idea that once again, under De Gaulle, France would become a great world power and centre of empire — an obsession which led to the wars in Indochina, Algeria and the Congo. This interpretation of history is patronising and elitist. 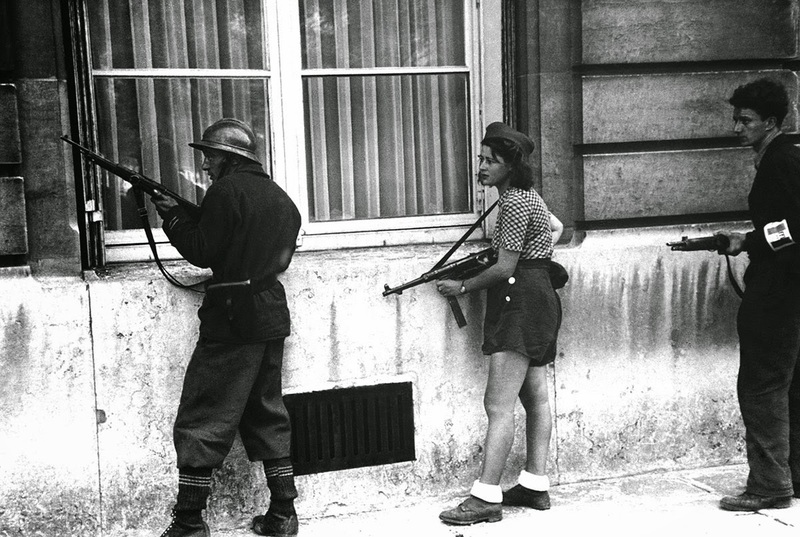 The French Resistance was a popular movement and in it the people of France fought — in co-operation with many others — with a courage and selflessnes that is hard to equal. It is equally true to say the Americans could never have liberated France without the French. And by the same logic one could ask if the trauma of failing to take Paris first led the United States into Korea, Vietnam and El Salvador? Soldiers of the Night is a moving tribute to a brave people who paid a heavy price for their decision to resist nazism. The lesson this book should have for all its readers is that although nazism may be a spent force, fascism and totalitarianism are still with us and no matter what the guise may be must be confronted at all costs if democracy is to remain "triumphant" as David Schoenbrun claims.